Midnapore, January 29: Continuing its commitment to re-instigate democracy in the state of West Bengal, Bharatiya Janata Party Chief Amit Shah stepped up his attacks on Trinamool Congress for its tyranny rule on people. The BJP chief gave a call for “change of government in Bengal” to make the state “Sonar Bangla” (Bengal, a land of gold) once again. Unravelling the false face of Mamata Banerjee who portrays working for the people of WB, Shah condemned Mamata Banerjee of ‘rebranding’ the central schemes as her own. He said, “Every fifth person in Bengal is poor, and has no access to food. Can West Bengal develop from this situation? Didi has propagated poverty and violence along with syndicate.” “Prime Minister Narendra Modi has started so many schemes which have extended benefits to West Bengal. Mamata Banerjee has rebranded them as her own schemes. She thinks the people don’t know anything…Mamata has stolen the right of the people of Bengal by taking away Ayushman Bharat from them. It would’ve provided healthcare up to Rs 5 lakhs to the poor. But she stole it from the people,” Shah said. 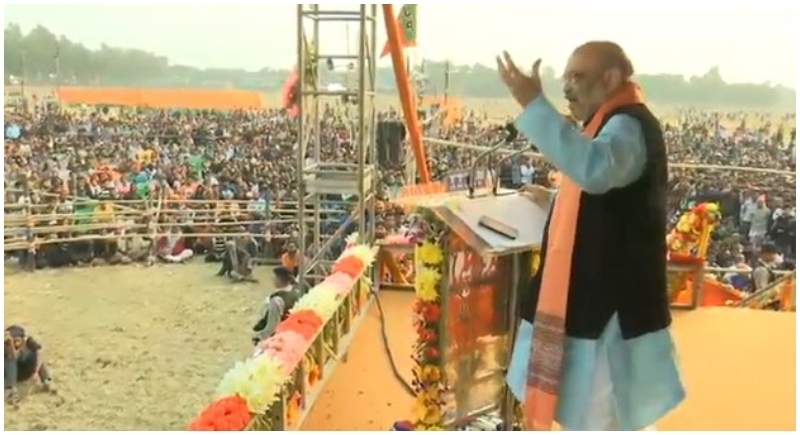 “For this nation, it might be an election to make Modi ji PM once again but for Bengal, the election is to make Sonar Bangla…The upcoming elections are not for re-electing Narendra Modi, it is for the re-formation of Sonar Bangla,” he said. Amit Shah alleged that the BJP workers were being killed in West Bengal for protesting the policies of the TMC government in the state. “The population of West Bengal wants a change. Why were so many BJP karyakartas killed? Their only crime was to protest against the TMC’s injustices,” he said. He raked up the issue of the government’s move to grant citizenship to the non-Muslim minorities taking shelter in India following their alleged persecution in Pakistan, Afghanistan and Bangladesh at the East Midnapore rally. Shah said the Sikhs, Hindus, Christians and other minorities are coming to India from neighbouring countries in order “to save the honour of their women”. He alleged that Mamata Banerjee was opposing the proposed citizenship law for political reasons.